This green cup was the kind of acquisition that makes me do a little happy dance. It happens every once in a while that an object truly speaks to me. I was sorry to lose a number of those in the fire, but I have rebuilt quite a collection in just the year I've been here! BTW, I'm quite happy with this painting. The cup resonates with you bbecause you associate it with a good experience. Such everyday things can give us much solace and comfort amongst all the not-so-good stuff that happens. Besides, the painting itself is great! Harmony of greens, with complimentary orange. Beautiful, and happy. BTW, can you eat those pieces after you've painted them? or are they too dry. They look delicious from here. The oranges looks delicious. Nice job! It's a stunner : ) LOVE! 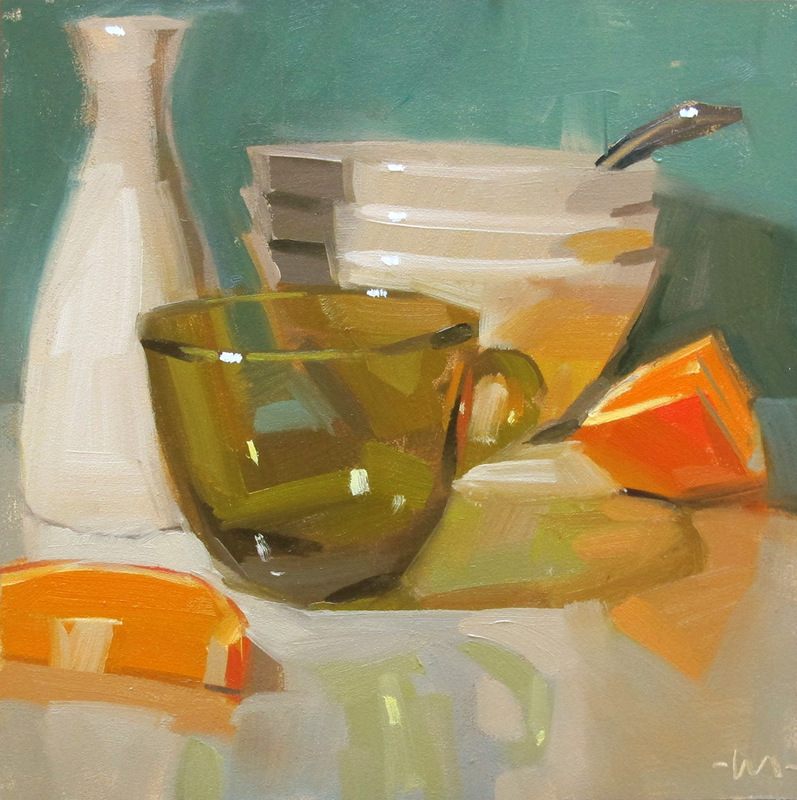 The Orange is my FAVE in this pretty still life...NICE WORK!!!! You should be happy with this painting, it's stunning. I love the way you have worked the reflections and shadows, at first glance it is the cup that captures my eye, but quickly I find myself engrossed in the hidden art. Depression or vaseline glass? I think?